If you are keen to undergo a series of epic Newquay Surf Lessons with world-class tuition, check out our Multi Surf Lesson Package! 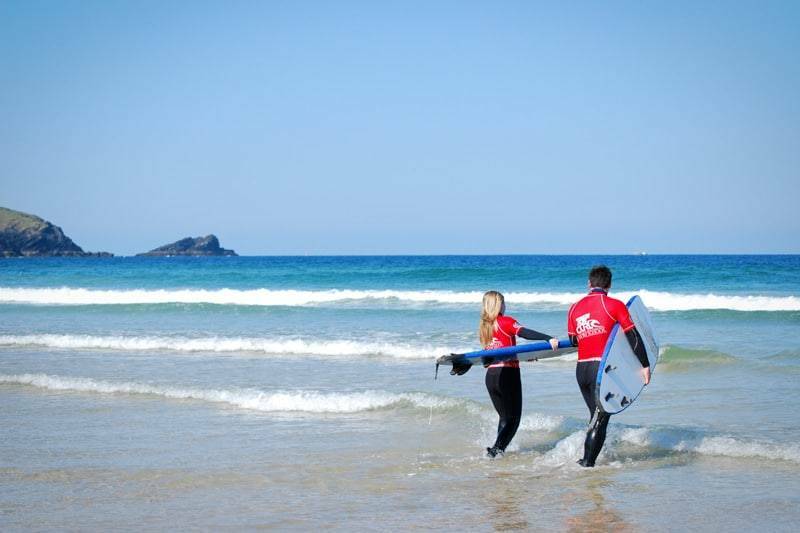 This specially crafted series of lessons offer great value for money and guarantee personal surfing progression from our base on Newquay’s Towan Beach. Your first session will be a two-hour Explorer Surf Lesson, during which you’ll learn the core surfing skills, techniques and basic manoeuvres through beach and ocean tuition. The small group setting ensures you gain maximum personal instruction and feedback from your instructor in order to build a strong sense of surfing fundamentals. We will issue you with a surf progression log to keep track of your on-going development and also take photographs in the surf, firstly for coaching purposes to review with your instructor and secondly for you to take home and plaster all over social media! We guarantee to capture you up and riding! Any following surfing lessons will be at a discounted rate of £30 each, so you can continue improving your skills under the expert eye of our professional instructors. For all of your Newquay surf lessons you’ll have access to our facilities including warm changing rooms, a hot shower and lockers to secure away any valuables. In addition to your surf progression log, you’ll have access to our excellent quiver of surfboards and be kitted out in a top of the range wetsuit.